A scathing critique of the Left from an indigenous anti-colonial perspective. Why am I writing this book? Because I share Gramsci's anxiety: "The old are dying and the new cannot be born; in this interregnum a great variety of morbid symptoms appear." The fascist monster, born in the entrails of Western modernity. Of course, the West is not what it used to be. Hence my question: what can we offer white people in exchange for their decline and for the wars that will ensue? There is only one answer: peace. There is only one way: revolutionary love. 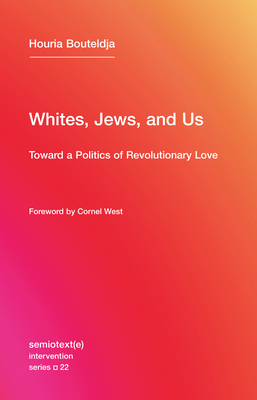 With Whites, Jews, and Us, Houria Bouteldja launches a scathing critique of the European Left from an indigenous anti-colonial perspective, reflecting on Frantz Fanon's political legacy, the republican pact, the Shoah, the creation of Israel, feminism, and the fate of postcolonial immigration in the West in the age of rising anti-immigrant populism. Drawing upon such prominent voices as James Baldwin, Malcolm X, and Jean Genet, she issues a polemical call for a militant anti-racism grounded in the concept of revolutionary love. Such love will not come without significant discomfort for whites, and without necessary provocation. Bouteldja challenges widespread assumptions among the Left in the United States and Europe--that anti-Semitism plays any role in Arab-Israeli conflicts, for example, or that philo-Semitism doesn't in itself embody an oppressive position; that feminism or postcolonialist theory is free of colonialism; that integrationalism is a solution rather than a problem; that humanism can be against racism when its very function is to support the political-ideological apparatus that Bouteldja names the "white immune system." At this transitional moment in the history of the West--which is to say, at the moment of its decline--Bouteldja offers a call for political unity that demands the recognition that whiteness is not a genetic question: it is a matter of power, and it is high time to dismantle it. This Semiotext(e)/Intervention series English-language edition includes a foreword by Cornel West.